Modern Machine Shop 85 2010s 2000s 1990s 1980s 1970s 1960s 1950s 1940s 1930s MANUFACTURING OF BEARINGS THEN AND NOW Seventy-five years later, I turned to Timken again in the spirit of the same appreciation. I showed the article to representatives of the company involved with bearing manufacturing and asked them what has changed. The importance of the product has not. 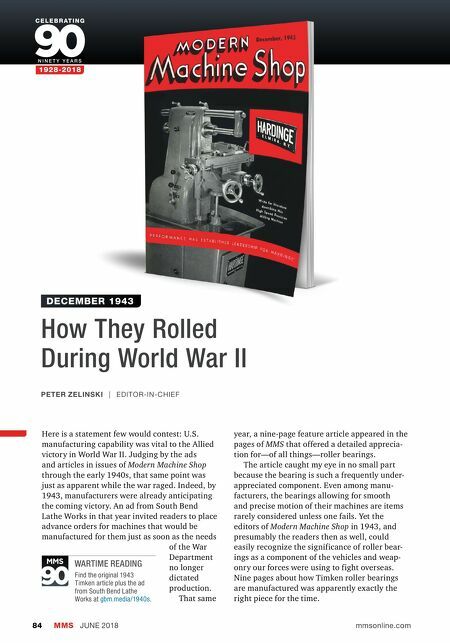 Today, the company provides mechanical power trans- mission products along with various bearing types, yet the tapered roller bearings in the World War II-era article remain an easily recognizable item today, still accounting for a large share of the company's business. Not surprisingly, however, practically every detail of the manufacturing process has changed, and Stephen Johnson says the differences started with the steel. Dr. Johnson is the bearing maker's head of R&D and a 43-year veteran of the company. He says the post-war period began what in retro- spect seems to him to have been the "gravy years" for the company's sales. 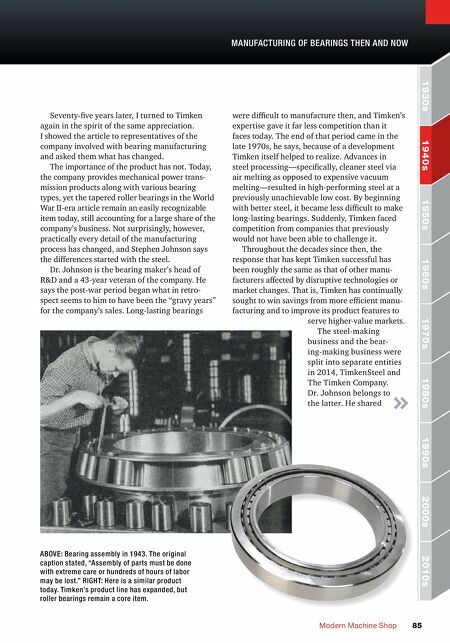 Long-lasting bearings were difficult to manufacture then, and Timken's expertise gave it far less competition than it faces today. The end of that period came in the late 1970s, he says, because of a development Timken itself helped to realize. Advances in steel processing—specifically, cleaner steel via air melting as opposed to expensive vacuum melting—resulted in high-performing steel at a previously unachievable low cost. By beginning with better steel, it became less difficult to make long-lasting bearings. Suddenly, Timken faced competition from companies that previously would not have been able to challenge it. Throughout the decades since then, the response that has kept Timken successful has been roughly the same as that of other manu- facturers affected by disruptive technologies or market changes. That is, Timken has continually sought to win savings from more efficient manu- facturing and to improve its product features to serve higher-value markets. The steel-making business and the bear- ing-making business were split into separate entities in 2014, TimkenSteel and The Timken Company. Dr. Johnson belongs to the latter. He shared ABOVE: Bearing assembly in 1943. The original caption stated, "Assembly of parts must be done with extreme care or hundreds of hours of labor may be lost." RIGHT: Here is a similar product today. Timken's product line has expanded, but roller bearings remain a core item.